Hello underachievers, professionals, housewives, skilled workers and un-skilled workers whoever you may be, Apes ? It´s that time again to drop you a line and let you know how i´m getting on. I´m fine, and you ? Good i hope ? Arrived back in Bogota from Villa de Ayera on a journey that took 5 and a half hours. Maybe there´s someting wrong with me, and i´m not ruling that out, but everyone tells me that the journey is 3 hours, but it took 5 and a half on a direct bus, maybe i lost 2 and a half hours on the bus somewhere along the road there was a big flashing light and i was abducted. By Alien´s i hear you mutter ? I hope so, well at least that would explain something, i could claim to be well travelled at least, it´s not everybody they select you know ! Arrived back in Bogotoa, awaiting Alison from New York´s arrival on Monday afternoon. 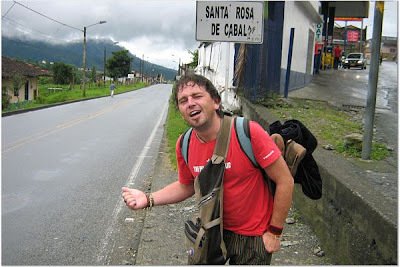 I was going to go by bus down to Quito and check out the Church in the south, but i just might fly it and feck the church off, i´ve seen plenty. But this church has a good story, and here´s what i know of it. One fine day, a guy, yes a guy, was out walking, while taking some drugs that altered his precepeption of the world. When all of a sudden he fell down a cliff, when he stopped falling, which was a good 70 meters he looked up then he had a vision of the Virgin Mary, so what did they do ? Well they built a Cathedral on the cliff, literally and the altar is where he had the apperation, and that´s why i want to to see the church. But on the other hand, i´m here to hang out and have fun, so, i´m managing that quiet well, so i think i´ll just continue. I´ve become a bit of a slalad junky, and thats a good thing, now all i need is to get some more good habbits. Why you might ask am i writing all this stuff, and the answer is simple, i´m listening to ´inthemix Digitalism: Remixes - ITM Exclusive!´ and i need to do someting, so this is it. I could be doing worse things, it´s just that i cant think of them right now, check my horiscope, in fact i will too. In general this can be a rather productive day especially if you attend to practical and constructive things. Bus rides last twice as long for me too. My explanation is that my santera aunt cursed my family a generation ago. If we were on the same bus I guess we'd be fucked.